Talking Breads on Thursday this week, as well as fresh McGrath’s on Friday and Saturday (as always). only this week. Butter sale continues, but, like all good things, the egg sale has come to an end. As we often do, last week Dusty and I brought home some urgent use items that still remained at the end of the day on Saturday. One of our challenges for the week is to use these items — urgently. Dusty is very good at this — he’s an excellent cook, but he’s also willing to eat almost anything. I’m a little more picky. Making matters worse, one of the things we brought home was some of the Castle de Franco radicchio, which I am, honestly, a little afraid of due to its bitterness. I am, I assume, a PROP taster — proud possessor of a bitter-taste receptor gene, which means that in the absence of measures to counteract bitterness, some foods (like radicchio) taste like straight up poison to me. Last week, I mitigated the bitterness of some roasted radicchio by drizzling it with balsamic vinegar just before taking it out of the oven, and that pretty much did the trick — I could still taste the bitterness, but since it was balanced with the sweetness of the balsamic, it was just interesting rather than poisonous. A pretty big difference. This week, in addition to the radicchio, we brought home some Jerusalem artichokes that were starting to get squishy. 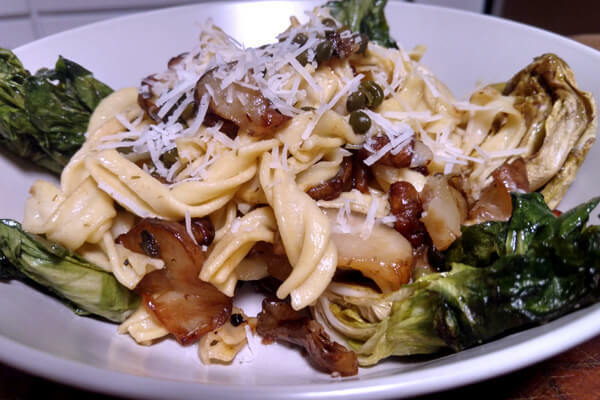 “Hmmm,” I thought, “Can I use the sweetness of the Jerusalem artichokes to offset the bitterness of the radicchio?” And so I devised this recipe for Pasta with Jerusalem Artichokes and Radicchio, adapted from maybe my favorite recipe of all-time. It worked! The sweetness of the sunchokes and the bitterness of the radicchio were a nice contrast to each other, and both were enhanced by the umami and salt of the anchovies and capers. The lemon juice at the end brightened it up, and the whole thing seemed just about perfect. I was pretty pleased. There is a catch, though: Jerusalem artichokes are apparently known in some circles as “fartichokes”. They are, you see, very high in inulin, which is an soluble fiber that our stomachs just can’t digest — but the bacteria in our guts thrive on it. Inulin is touted by some as being an excellent prebiotic (helping to encourage the growth of good gut fauna), and as increasing the absorption of some minerals (calcium, and maybe magnesium). On the other hand, it can make you gassy, at least for some people, at least in some quantities. And there’s some argument that maybe it doesn’t actually discriminate between the good and bad gut bacteria, but simply provides an excellent diet for all the little guys you’ve got in there. Who knows. What I do know is that that pasta was really yummy. I have scaled back the amount of Jerusalem artichokes called for compared to my original rendition because 1) I think my first version included more than it needed, and 2) maybe you don’t want to eat that many Jerusalem artichokes in one go. On the other hand, if you don’t think radicchio is bitter, or don’t mind the bitterness, you might prefer to skip the Jerusalem artichokes completely and make something more similar to the original recipe — using radicchio of course, instead of kale.